Can the new IRIS scanner really live up to its claim? The software element of the IRIScan partnership is accurate and powerful. Efficient document scanning is achieved by both elements of hardware and software. The software component of IRIS's latest scanning equation comes in the tried and trusted shape of Readiris Pro 9, which we'll come to later, but first the hardware. Whereas most scanners are bulky blighters that encroach all too heftily on your desk space, this one's slim and svelte. Barely wider than the sheets of paper on which it feeds (up to A4 or Legal in size), the scanner's height and depth are comparatively minuscule at just 37mm and 50mm, respectively. Finding sufficient space for the device is definitely not a problem. In spite of its compact size, the IRIScan scanner plays host to a motorised paper transport system that draws in individual sheets. It then passes them over the scanning head assembly at a steady pace and ejects them automatically. This example of space-saving simplicity is enhanced by low-power CIS (contact image sensor) scanning technology, so there's no need for a power supply. You'll find a dedicated graphics card supporting the display on the host PC. Our only gripe is that, at just 50cm, the hardwired USB cable is relatively short so a USB extension lead may be required to reach the relevant port on your PC from the scanner's perch on the desktop. The software element of the IRIScan partnership (the Readiris Pro 9) is accurate and powerful. In our tests, the software made an exemplary job of 'reading' text documents and converting pages into text files by the power of OCR (optical character recognition). In addition, the software can distinguish between columns of text, tables and picture elements on a page, more often than not correctly rebuilding them into accurate, editable data files. You can elect to save scanned documents in Microsoft Word, Excel or Adobe PDF file formats or even as HTML documents. 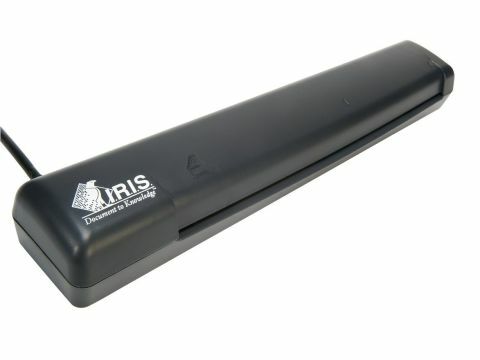 Compared with the last IRIS document scanner and OCR solution we reviewed, as well as other rivals in its field, this system proved uncannily accurate, cutting down on the time needed to correct errors. You can't expect perfection, but the IRIScan offers the next best thing.